In case you missed it, the heat is already on this summer. It seems to us that you should be able to have a great cookout that doesn’t necessarily entail slaving over a hot stove/oven or grill. Take a look at a couple of our favorite cool dishes and a hot tip! Cucumber, Basil & Mint Soup – A dash of hot sauce gives cucumber a bit of sass in this no-cook recipe. 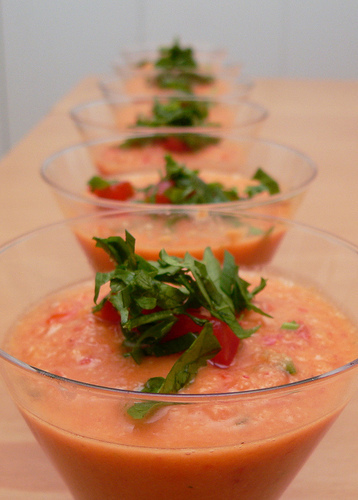 Gazpacho – The ultimate summer soup, bursting with fresh flavors. Avocado Bisque – Rich, delicious and nearly crying out for tortilla chips to dive in. Instead of serving the gang with plastic plates, why not go green? Made from leftover sugar-cane stalks, bagasse is a natural material that’s been made into inexpensive plates, cups and trays to beautifully handle both hot and cold food. When the meal’s done, the biodegradable ware can go into the compost bin, saving it from the garbage can and the landfill. For more information, visit www.greenhome.com. We’re always on the lookout for a cool summer dish. Let us know what you’re cooking up this summer.